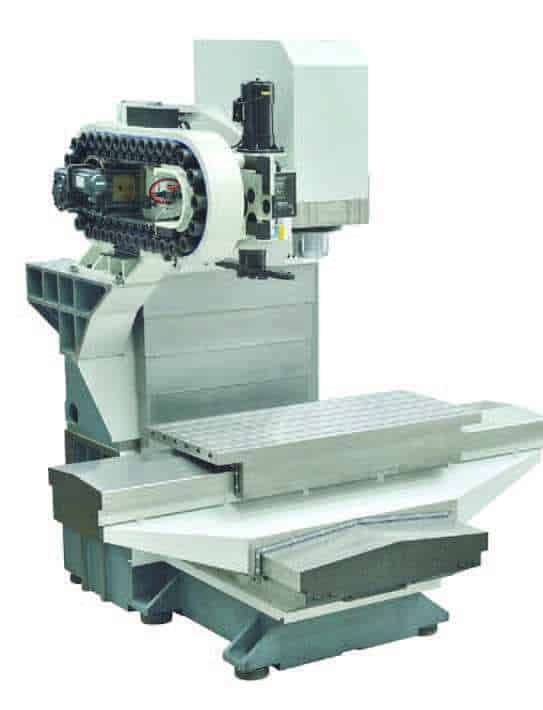 By employing a novel method for protecting the table’s X and Y axis guideways from swarf and coolant ingress, using a single wiper system and without recourse to telescopic covers, the German machine tool manufacturer, Spinner, has managed to endow its new VC1150 vertical machining centre with a working volume of 1,150 x 620 x 600 mm in a compact footprint of barely six square metres. This is up to 30 per cent smaller than for other machines of similar capacity. Additionally, the height of the machine has been kept to a maximum of 2.7 metres, allowing it to be installed in factories where headroom is limited. Availability in the UK is through sole agent, Whitehouse Machine Tools, Kenilworth. The distance from the operator to the front of the 1,400 x 620 mm table has been minimised to 200 mm for convenient workpiece loading and unloading without strain. The heavy, FEM-optimised cast frame of the 8.3 tonne machine provides high rigidity and vibration damping, promoting accurate machining and long tool life. Optimal chip evacuation via a conveyor at the front ensures negligible transmission of heat to the machine elements and workpiece. Many options allow the 3-axis machine to be tailored closely to a user’s needs. There is a choice of a 5,000 rpm / 390 Nm high torque spindle, standard 10,000 rpm and 15,000 rpm versions (all SK40), or an 18,000 rpm HSK63 option with 35 kW of power for high speed cutting. Tool magazine capacity can be either 32 or 60 stations. tor convenience, both the control panel height and keyboard angle are adjustable. 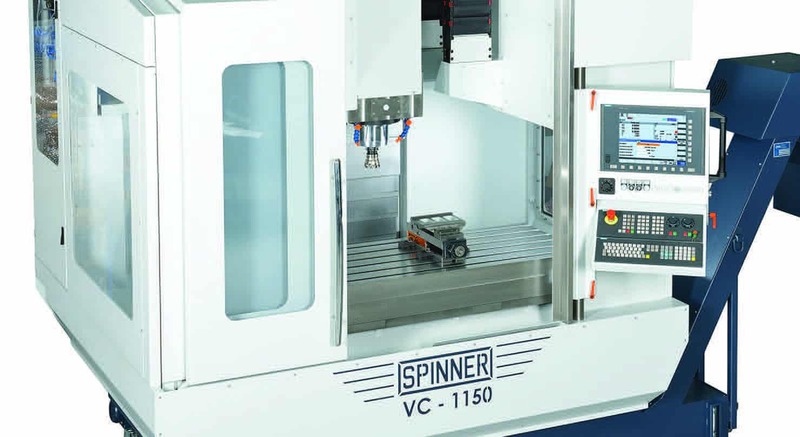 There are numerous other opportunities to customise the Spinner VC1150, which is manufactured at the company’s factory in Munich. Further equipment that can be supplied include a rotary table, coolant mist suction unit, high pressure coolant delivery (22 or 70 bar), hydraulic workpiece clamping, workpiece and tool measurement, glass scales and various tooling packages.